This past weekend, in a fit of pique that was probably less than appropriate, I left a comment on Twitter that I was thinking about forgoing officiating at weddings for any couple under the age of 25. As I should have expected, I received all sorts of comments from folks who had married young and had vital and loving marriages. While no one totally flamed me, let’s just say that these folks generally found my comment less than inspiring. Okay, I am willing to admit that I was tired and had just come from leading a wedding rehearsal in which there were 27 people in the bridal party, including the bride and groom, the attendants and groomsmen, the ushers, and the flower girls and ring bearers. Trying to lead a wedding in that context is kind of like herding cats, and I can easily find myself beating my head against the wall, which is more of my issue than that of the couple. Yet, while I acknowledge my own frustration in the midst of a complicated situation (and wish the bride and groom many happy years!!! ), it called up my memories of officiating at some thirty to forty weddings during the past ten years and affirmed my experience which says that the younger the participants are, the more likely that the wedding will be large, expensive, and involve all sorts of elements that older couples quickly write off as superficial and unnecessary. Now that may indeed have more to do with the nature of the congregations that I have served over the years, but my experience so far suggests that younger couples are more fixated in the romanticism of the event than their older peers. They are much more likely to see their relationship through rose colored glasses, and believe that somehow that the size of the event somehow is a symbol of their love, especially when mom and dad are footing the bills. Certainly my view of this is colored by my disdain for the entire wedding industry, and the belief that somehow this act (or sacrament, depending on your theological perspective) is somehow more special than any other in the life of the church. As one who believes that our baptism is the primary sacrament of grace and the rite of initiation into the community of the church, I find it troubling that we spend so much in time and resources toward affirming the covenant of marriage, but often find ourselves rather skimpy in how we celebrate the giving of God’s grace in baptism to an individual. It may be idealistic, but I will only be fully satisfied when we are willing to spend as much money and time on a baptism as we do on a wedding. However, my disdain increases when I experience the rhetoric of bridal magazines and professional wedding planners which suggests that the wedding day is all about the couple. Uh . . . maybe in a secular context that is true, but when one gets married in the church context one much recognize that this ceremony is ultimately about what God is doing between this couple rather than a “celebration of their love.” To be married in the Church is to celebrate the power of God’s grace in the lives of the couple as they promise life long fidelity to one another in the midst of a supportive community of faith which pledges as well to help and support them in the keeping of their covenant. Early in my ministry, when I was new and fresh in ministry, I didn’t fully understand when my colleagues seemed less than excited about officiating at weddings. It wasn’t that they didn’t like to do them, or that they didn’t recognize the opportunity for grace to be shared in being a part of this transitional life event; it was a recognition over time that very often we are simply stage props in a drama constructed in the fairy tale world promoted by the wedding industry. 1) The pastor is your friend in all of this, but the pastor also takes this task seriously. I can’t speak to the practices of all of my colleagues, but I know that I take the task of officiating seriously, understanding that my role is to help you think about the significance of what you are about to do, and to provide resources to help your marriage flourish. Certainly, I am no guru on the subject of marriage, but I have been trained to think both theologically and psychologically about relationships, and part of my task is to help you think about all the issues involved, for marriage can be both a wonderful and a difficult thing. Thus, any requirements your pastor may have about marriage counseling is not simple a formality or busy work, It is an opportunity for you to take advantage of a person who has both experience and training in dealing with relationships to make your relationship sound as well. Take this time seriously, for your pastor has likely invested time and energy to be a resource for your marriage. 2) The pastor is not a stage prop, but a professional whose time and energy should be respected. When you think about it, the pastor and the congregation (witnesses) are the only part of the wedding that you can’t do without. Yes, YOU CAN have a wedding without musicians, without flowers, without fancy clothes and special decorations. But, in order for a wedding to happen in a church context you need three things – the bride and groom, the congregation to witness to the making of the covenant, and the pastor to officiate. So if this is the case, why then do you spend so much time and energy on flowers, on decorations, on catering, and then expect the pastor to bend his or her schedule to your will? What do I mean by this? Well, I will hear folks all the time talk about how they are taking off work to meet with the caterer or the florist. However, when the pastor is trying to setup a time for counseling or conversation on planning the service, almost always the couple will talk about how they can’t get off work and that they need the pastor to come back in the evening. Certainly most pastors, myself included, accommodate these needs, recognizing that ministry is in fact more often a second shift job. But, when one hears the couple talking about how they took off to meet with the florist one quickly understands that the couple believes the flowers, decorations, and photographs are more important than what the pastor is engaged in. So, when you talk to your pastor about scheduling time to meet, understand him or her as a professional, in the same way that you think of a doctor or dentist, and work your personal schedule around his or hers. Understand that the pastor has a job to do that is as important, if not more important, than anything else that happens in the service. Treat him or her with respect, understanding that they are the experts in conducting weddings, just as photographers are experts in ensuring that your pictures turn out well. 3) The pastor doesn’t do this for money, but… Folks often ask me what I “charge” for doing a wedding. While some of my colleagues do have a set fee, especially for persons who are not members of the congregation, I believe that officiating at weddings is part of my duties as an appointed pastor, and as such have no set fee. It seems odd for me to charge for a ministerial function, and I know many who feel as I do and leave the gift of an honorarium up to the couple. However, while I have no expectation of a particular amount, one should take into consideration the amount of time and energy that is involved in preparing for the wedding by the pastor. Usually the pastor presides over anywhere from four to six hours of wedding counseling (in our state, four hours of counseling gets you a $90 discount on the marriage license), which may also include time outside of the counseling session scoring marriage inventories (like FOCUS or Prepare/Enrich) and planning what you will talk about. The pastor is normally the person who runs the wedding rehearsal, involving both time in leading the rehearsal, and time in making sure that the order of worship is prepared. Then the pastor is usually involved in at least a couple of hours of work on the day of the wedding, not including any work involved in resetting the sanctuary for Sunday’s worship (in small churches like mine). Thus, for the average wedding, I may have anywhere from 10 to 14 hours invested in ensuring that you have some resources for success in your marriage, and that the wedding ceremony is meaningful and theological significant. Thus, as you are thinking about how you might gift the pastor, think about that effort in relationship to what you are paying others to help with the wedding. The musicians, for example, may have three to four hours invested in preparation and performance but the average fee for most performers at weddings is in the $200 range. The photographer may have ten or so hours invested in the day, but will be paid thousands of dollars for his or her expertise. Again, the pastor is the one of the three mandatory elements of the service, and thus you should consider offering a gift that recognizes the time and expertise he or she brings to the table. Think of it this way… If you can’t afford to honor the pastor for his or her time, how can you afford those fancy flowers and the five tier wedding cake with your pictures engraved on the top? 4) Think seriously about what you are spending. This really has nothing to do with the pastor and is much more a piece of advice for you. Most pastor’s, myself included, have some sense of the extreme burden that consumerism places on our society, and we generally hate to see resources wasted on superficial things. So, when we walk into the sanctuary and see decorations that we know cost in the thousands of dollars, our hearts are grieved for we know that this is such a passing thing which has no lasting significance on the quality of your marriage. The good news in 2008 is that the average cost of a wedding in the United States declined by 24%. However the bad news is that the average cost of a wedding, not including rings and/or honeymoon, is still just over $21,000. That is, of course the median cost, with some costing far less and some costing far more. I certainly believe that you should have a great celebration of this special day in your life, but think seriously about how you are spending your money for things can quickly get away from you. This goes back to my original comment about age and marriage, for my experience suggests that more often than the weddings of younger couples are paid for by parents with the couples more focused on getting what they want than on the costs involved. Older couples generally seem more realistic about the expenses, often because they are more directly involved in paying for the wedding, and seem to set better boundaries around spending. Certainly, you can spend to hearts desire, and the tradition of weddings in Jewish and Mediterranean culture that is a part of our religious heritage sees these as great celebrations worthy of mortgaging the house. But I encourage you to spend wisely – invest in a big dinner rather than an aisle runner – for those are the things that are the most memorable of all. I’m afraid in venting all of this I sound whiney and not especially positive about my role in performing weddings. Understand that I DO take the responsibility seriously, that I DO have great joy in seeing couples come together to commit themselves to one another, and that I DO enjoy my part in helping these folks through this transition of life. Weddings are part of what I do, so I have a chance to think about them more than the average bear, and my prayer is that everyone will take some time to think about them a bit more intentionally as well. The age of the couple is often a factor in how frivilous a wedding can be, but so is the income and sanity level of the parents, particularly the bride’s parents (assuming the parents are involved financially, of course). If there are parents with long unresolved issues and money to burn, look out! I won’t name names, but there have been several weddings where I was very close to walking away. Good thoughts, Jay. Perhaps they should be published in one of those evil bridal magazines or websites! Excellent post, Jay. I agree with everything you’ve said. I’ve been there and done that. After 10 years of extension ministry one of things I do not miss about parish ministry is weddings. I feel your pain. Well said Jay. I have but one additional observation for you. I didn’t used to have a set fee or ‘charge’ for my services either. I do now. Let me tell you how pleasantly surprised I was when much of the frivolity disappeared and my schedule opened up as a result. Trust me, set a reasonable but fair fee and talk about it up front. It works. Well put & thoughtful jay!!! I feel compelled to comment, being one of those “got married young” people. I was married at the sprite young age of 20. And, while I hope I wasn’t as frivolous as some of the brides you’ve encountered, I do realize, looking back, that there are lots of unnecessary things I’d do differently, even just 5 years later. I think, however, the root of the problem is in our focus on a wedding. As my mother so wisely told me over and over again through the process of planning our wedding, the wedding’s only one day. It’s the marriage you really need to prepare for. In our society, we focus too much on the wedding day, and not enough on preparing for a future as husband and wife. Maybe that is related to how old you are when you get married, but I think it’s more so related to the people who surround you as you get married. The huge, expensive wedding is just a symptom of the deeper problem. I, for one, had my mother reminding me what was most important. For some couples, they only have the pastor, and that makes your role even more important. Jay, thanks for these and I agree with all 4 of your points. I did a wedding last year and was routinely blown off by the couple (who were 19 (bride) and 31). I was simply window dressing and last on their list of importance for the actual wedding. If it wasn’t for my deep respect for the parents and other family involved, I would have said I couldn’t do it. I agree with you on the honorariums too. I think it is part of our ministerial duties but God knows we (as clergy) earn every penny with all the hoops and hurdles we jump through to make ‘their big day’ perfect. My fiancée and I are planning a wedding for next year and as a future pastor I’m trying to be reasonable about how I treat everyone involved and how frivolous the entire thing can become (We are both 20). I will be paying for a lot of it so that definitely makes me think twice about every expense I encounter. Thanks for this post; I will definitely keep these in mind as my fiancée and I continue on toward marriage. I perform the rehearsal and wedding for free, but charge $150 for three sessions of pre-mariage counseling. That separates the wheat from the chaff very quickly. I also recommend age 25+ for marriage, but have a minumum asge of 21. And every couple 25 years of age or older always agrees wholeheartedly that they are much better equipped to marry at 25 than they ever were four years earlier. This is all good advice. The age thing does bother me though. My husband and I were both 21. We had what I jokingly call the $18 wedding (that actually was exactly how much we paid). Our families didn’t have the money and I was too practical to go into debt. But you have to understand that cultural expectations run deep, even in the most rational people. I am not a girly girl and am much more rational than emotional, but I still cry a little bit occasionally when I pull out the picture of the dress that I wanted but didn’t get. Also, I’m concerned about the church joining our culture in pushing marriage age later and later. By the time that women get married these days they are far past their prime childbearing years and then they often go through the anguish that goes along with conception and pregnancy difficulties. If people under 25 are not mature enough to get married then there is something wrong with the way that our culture is raising its children. I should probably mention for context that we’ve been married for nine years, have three children and my husband is still my best friend. 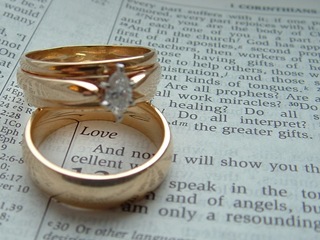 Do you do any preaching/teaching in your congregation on the subject of weddings? What I’ve done before is take the liturgy as my text for the day and just walk through it and explain it – adding in the biblical and theological background. As someone who’s going to be married in a little over a year (I’ll be 25, she’ll be 24) and who also plans on going into ministry, I really appreciated the advice in this article. My fiancee’s parents are paying for this wedding, but I’m actually grateful that my her Mom has put a cap on how much she’s willing to spend, and her cap is below the average cost of a wedding. I agree with indie; our society has done a TERRIBLE job of raising our children when it comes to teaching them to sacrifice and live simply, and that has pushed the average wedding date further and further as people wait for the “right time” to get married…”right time” usually meaning when they’re able to financially support themselves, which gets pushed further and further back as many parents not only pay for undergraduate education, but graduate school as well. I first saw this on the United Methodist Portal, so keep up the good work in writing for them! WEll, Jay…what a surprise to open up my N Ga WCA and see your article in the Recorder. It’s been a long time since seminary. In my second app’t, I became the ‘appointed clergy’ to do weddings, because my Sr. Pastor didn’t do ‘live togethers’, but graciously told them I’d do it. I like doing weddings and pre-marital counseling. He also taught me to set very specific guidelines….fees, counseling, communication on numbers, etc, etc. I am grateful. In my first ‘pastor-in-charge’ app’t I had a ‘sweet little church in the wildwood’ (that’s what brides said when they wanted to get married there…many non-members. the church got a fee and so did I… It’s amazing how many folks didn’t have a clue.. BUT I used it as an opportunity to disciple.. My bigger issues than the frivolities has been making the rehearsal and often the wedding…a big cocktail party, espcially with off-site locations. I now make it a policy, if I do a wedding for folks I don’t know (at least their families) that there is no alcohol before the rehearsal and beg for none before the ceremony. I appreciated all your comments, and with another person commenting, I really suggest that you set a fee with perhaps as a church policy….not a concrete fee, as you may feel you need to ask for more or less or none, depending on the situation…So, so good to hear from you…. I have not thought about A Preacher’s Rant on Weddings | Only Wonder Understands like this. I need to mention I adore your site. by the way! You’ll want to include certain supplemental photos and videos on https://onlywonder.com/2009/03/15/a-preachers-rant-on-weddings, that way it’ll be considerably more intriguing for future readers. Desire that will assist!